One Girl. Her Missing Mama. Buried Secrets. Copper Daniels' home is among the graves at Eternal Peace cemetery ... until, she wakes up to find her mama's disappeared. The feisty girl sets out to bring back the one person who's her whole world. Despite her best efforts, Copper comes up empty-handed, so she gathers the courage to trust a few of her misfit friends. Together, this rag-tag group follows many twists and turns in search of the truth. In the end, Copper risks everything for a love that just might break her heart, or save her family forever. 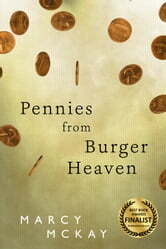 Pennies from Burger Heaven makes you laugh one minute, then cry the next. It stays with you long after you've read the last page. This book was one of the most different novels I’ve read in a long time, being about homelessness, addiction, prostitution and all the horrors that go along with that, but it was also about love and loss, friendship, honour, and bravery. It was a bit hard to begin but once begun it was very hard to put down.